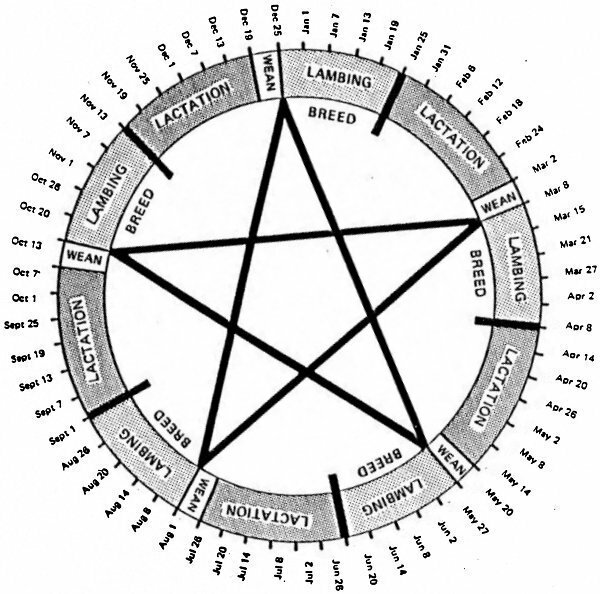 The STAR can be rotated to start on any date. The Cornell STAR© accelerated lambing system was developed by Brian Magee and Doug Hogue. The benefits of the system are easy management to provide lambs for year-round marketing and increasing production per ewe. 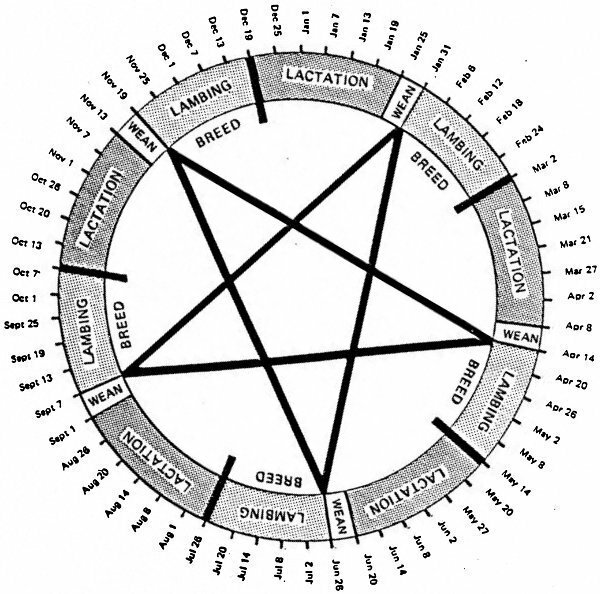 If the flock has been intensely selected for aseasonal breeding, each of the five breeding seasons can be shortened to 21 days. This reduces total days of lambing from 150 to 105 days. Brian wrote and produced an excellent video about STAR management, which is available STAR video. Scroll down a bit to see two animations. 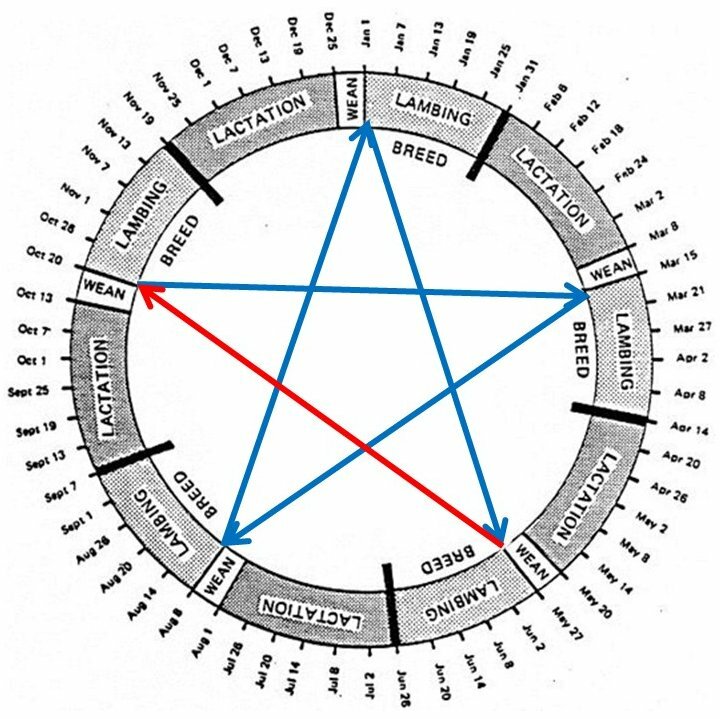 The first one explains the STAR management system by following a “perfect” ewe that lambs on the STAR for the first time on 1 January and continues through three years. 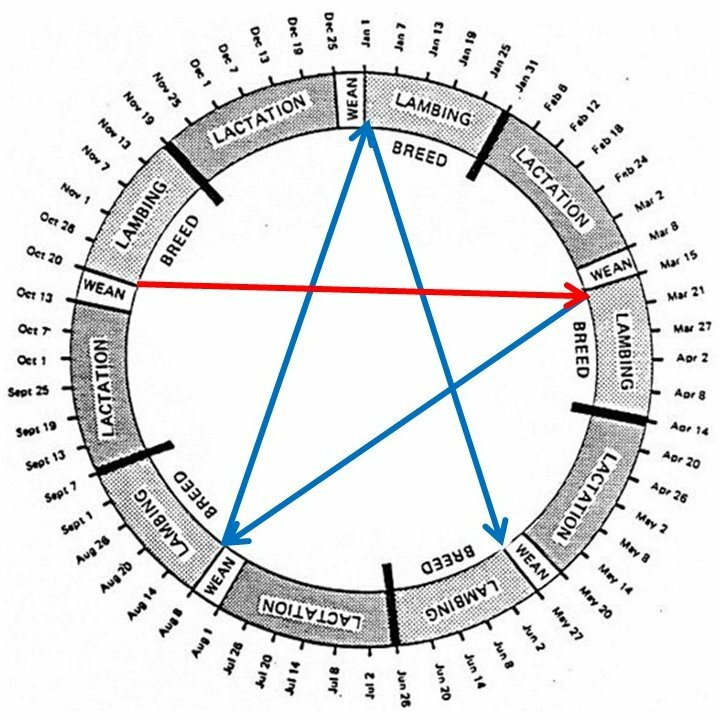 The second one shows how the STAR can be rotated to start the first lambing of the year any time between 1 January and 8 March. The actual last possible date for the first lambing in a year is 14 March. Hoover over either animation to stop the action. 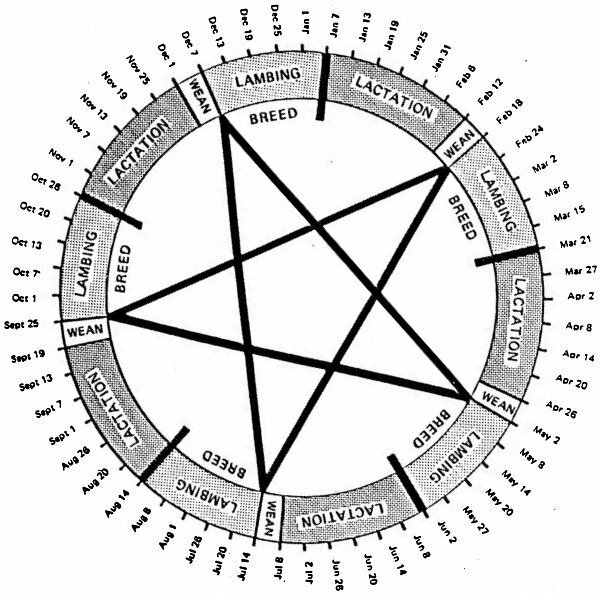 The STAR system of sheep production (Figure 1) has been developed to maximize production of market lambs on a continuous year-round basis. This even supply of high quality lambs should allow for improved market development and enhanced prices for lambs demanded by discriminating consumers. To be successful, a maternal ewe flock that will breed any time of the year and produce mostly twins at each lambing is necessary. Sheep are normally seasonal breeders and lamb only in the spring so proper selection and continued development of the ewe flock is very important. Cornell STAR accelerated management system diagram. Breeding and pregnant ewes and the rams. Lambing and/or lactating ewes and their lambs. Growing lambs – both market lambs and the replacement ewe lambs. These three groups are kept and managed separately. Late pregnant ewes are moved from the breeding and pregnant flock five times yearly just before lambing and the lactating ewes weaning lambs are moved to the breeding and pregnant flock at about the same time to be bred. 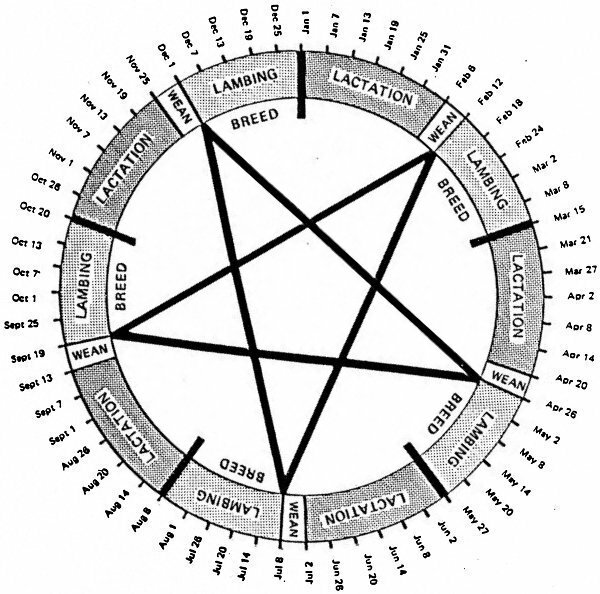 This shifting of the sheep and the suggested dates are depicted in Figure 2. Also at the time of weaning, lambs are moved into the growing lamb group. These lambs are fed in this group until they are ready for the appropriate market as depicted in Figure 2, thus allowing for a rather continuous supply of market lambs and a reasonably steady cash flow pattern. Figure 2. 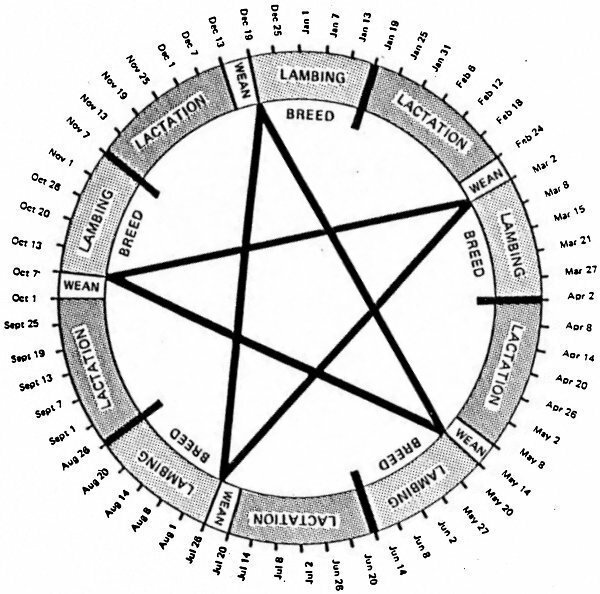 STAR diagram showing all sheep in system (Richard Ehrhardt). 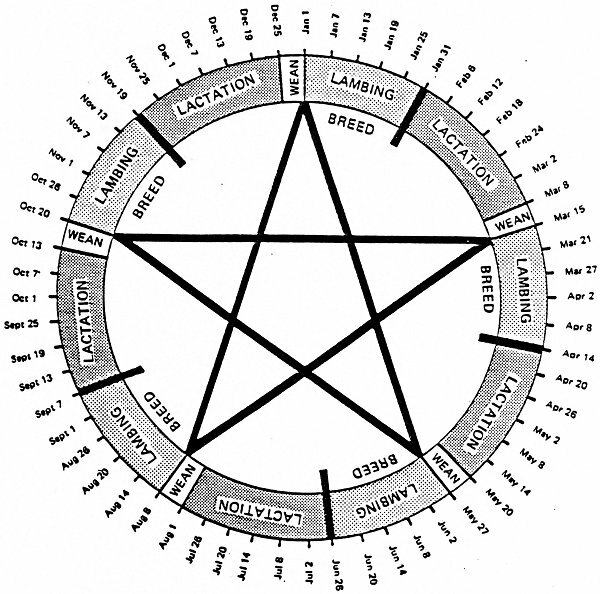 Even on the rather complex STAR system, we only have to contend with the three groups of sheep. Each group will be managed and fed quite differently in order to meet their requirements and to allow the production expected of them. The producer allocates available feed resources to those animals that can best utilize them and can purchase the additional feeds necessary only for those high producing animals that cannot meet their requirements on the feeds available on the farm. Resources other than feeds such as labor and buildings can also be allocated accordingly. These three groups of sheep can be considered as separate flocks because their requirements are so different. They are discussed separately. The Breeding and Pregnant Ewe Flock This includes all the ewes from the time they wean their lambs until they are ready to lamb the next time. It also includes the rams and the young replacement ewes just entering the flock to be bred for the first time. Because breeding occurs in this flock, it is here that the genetics of the entire flock is established, whether the resulting lambs will be market lambs or have the proper breeding to be replacement ewes. Sire selection and proper mating for each is very important. The ewes must be of the type that are not seasonal breeders. Most sheep are seasonal as a result of their sensitivity to changing day length, but some breeds are less seasonal that others and there are some sheep in all breeds that will tend to breed “out of season”. At Cornell, we have preferred the Dorset because they are reasonably aseasonal and we have an established flock. The fine wool breeds, namely the Rambouillet and the Merino, also have longer breeding seasons than most breeds. We have also identified some Finnsheep that not only are prolific and have lots of lambs but will also breed out of season. The Polypay is a newer synthetic breed that has been developed to provide more than one lamb crop per year – thus, the name “Polypay”. They are actually a 4-way cross between the Dorset the Rambouillet, the Finnsheep and the Targhee. Producers of several other breeds have also had reasonable success with fall or out-of-season lambing. Recent calculations, made on records of the Cornell Dorset flock, indicates the heritability of out-of-season breeding is about 0.2. Considering the magnitude of variability present, this estimate indicates we should make reasonable progress selecting for sheep that will perform well on accelerated lambing systems such as the STAR. These Breeding and Pregnant Ewes have relatively low requirements. They need little housing and can be pastured much of the year. The Cornell Dorset ewes utilized excess stock-piled pasture and aftermath growth the past two winters until early March. These were, of course, fairly open winters without heavy snow cover. The Lambing and/or Lactating Ewes and Their Lambs This group requires a relatively high level of both feed and management throughout the year. At Cornell, we lamb all the ewes in the barn and at this time keep the ewes and their lambs inside until weaning. Note in Figure 2 that several of the lambings occur in warm weather and these ewes could be pastured at least some of the time. Also, note that the ewes in this group shift in and shift out five times a year on a fixed schedule. 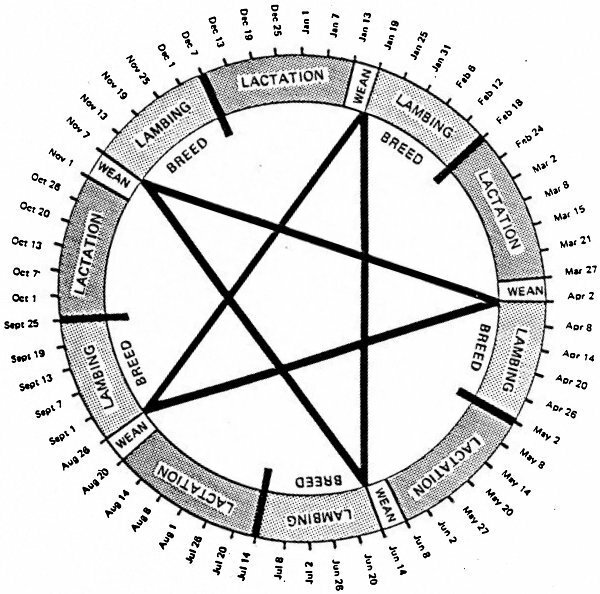 It is also possible to “spin” the STAR and select the set of 5 dates best suited to each individual producer. We feed ewes in this group either good quality hay or hay-crop silage free choice and grain at the rate of 1 lb per day for each lamb. That is, ewes with one lamb get 1 lb and ewes with twins 2 lb. Ewes with triplets or even quads require more. Artificial rearing is necessary for excess lambs from the very prolific ewes. Lambs are also given access to creep feed from about two weeks of age to weaning. Often the same feed is used in the creep that will be the lambs main feed after weaning. It is important that lactating ewes not be allowed to lose much weight as they must be able to re-breed soon after the lambs are weaned. Growing Lambs Growing lambs are fed a properly formulated total mixed ration from weaning to market. When they are marketed depends on the market demands and the breeding of the lambs. Some markets prefer the typical hothouse lamb at 35-40 lb live weight. This is a specialty market and Dorset lambs about weaning time do nicely. Most markets are for larger lambs weighing from 90-120 lb. Our medium-sized breeds such as the Dorset have the proper body composition at about 100 lb, with the ewe lambs about 10 lb lighter than the ram lambs. Lambs sired by large terminal cross sires such as the Hampshire and Suffolk should be sold at the heavier weights. All the lambs in this group can be fed and managed the same even though they are marketed at different weights. The best market weight for each lamb is really determined by the ram at the time of breeding. All the ewes in the Breeding and Pregnant flock should be of moderate size and able to produce twin lambs any time of the year. This is where the market lambs start and selection of the proper ram for breeding is very important. Selected ewes in this group can be mated to the proper maternal sire to produce replacement ewes. 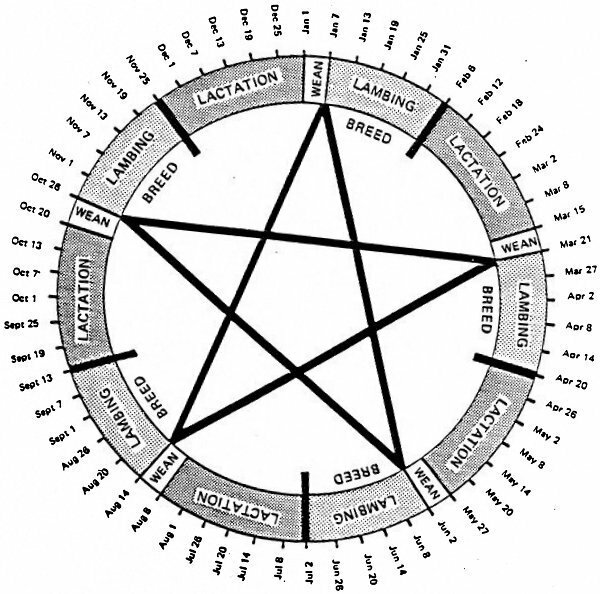 This does not begin to cover all aspects of proper STAR sheep management but should give the reader an understanding of how the STAR system works. It should also explain how the STAR system can increase production as well as make a uniform supply of high quality lamb available to the consumer and provide an even cash flow to the producer. Five years ago the Cornell University Dorset flock was started on the CAMAL System (Cornell Alternate Month Accelerated Lambing). On paper it seemed like a good approach to maximizing lamb production from Dorsets. Every other month the ewes were exposed to a ram and alternate months the ewes lambed. The ewes were given a chance to lamb on a 6, 8 or 10 month interval. Unlike a three in two years scheme, the ewes were given several chances to lamb on an accelerated schedule before they returned to once a year lambing. 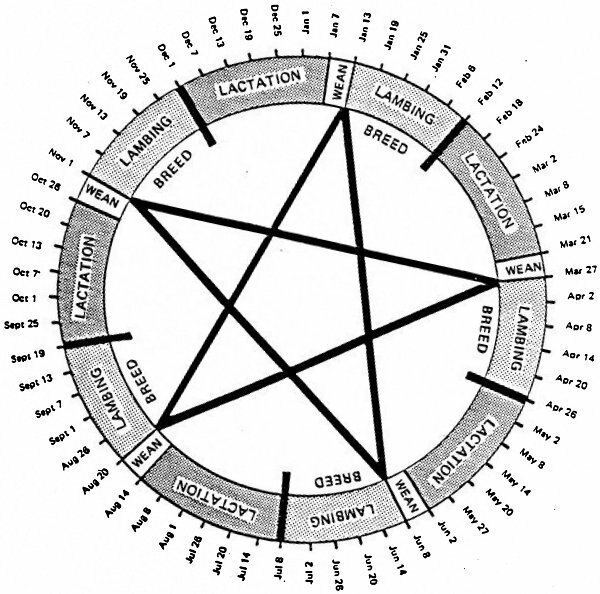 It became apparent in the first year that one problem with the CAMAL system was the difficulty encountered in predicting stages of pregnancy for proper feeding. It was even more difficult to predict which breeding period would result in pregnancy for effective flushing. 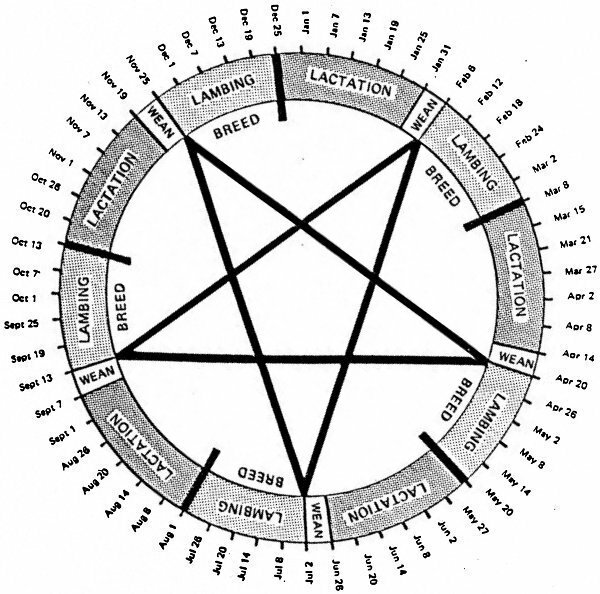 In order to solve these problems of pre-partum and pre-breeding feeding, I devised what Dr. Hogue calls the MAGEE system of accelerated lambing. Instead of alternate lambing and breeding periods, the lambing of one portion of the flock coincides exactly with the breeding of another portion of the flock. In this way the entire flock can be managed as a unit throughout most of the year. Flushing and pre-partum feeding can be accomplished on a flock basis and sorting out pre-partum ewes can be postponed until quick sorting by palpation of the udder is possible. The shortest interval between lambings on the MAGEE system is 7.2 months with a second chance at 9.7 months. 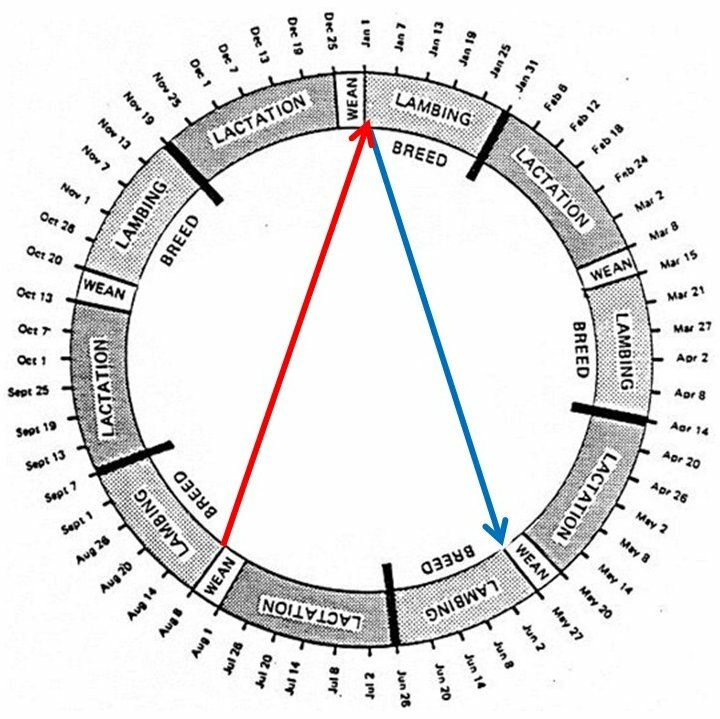 There are 5 lambings yearly instead of 6 with the CAMAL System and a ewe can achieve 5 lambings in 3 years if she completes the cycle perfectly. 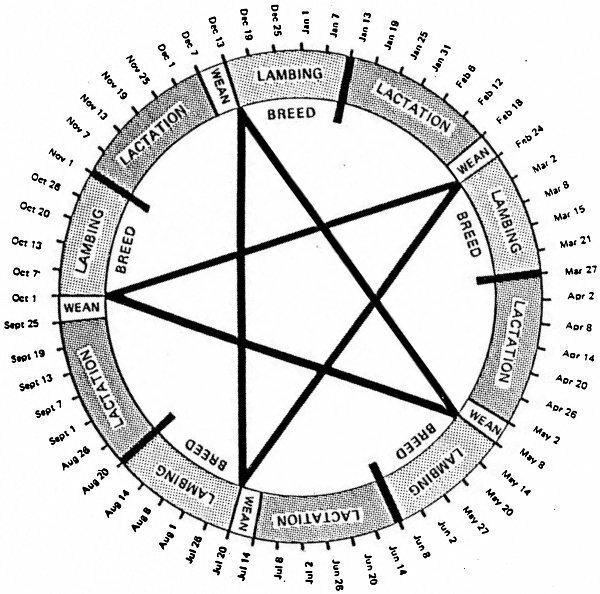 The numbered superscripts in Table 1 plot the sequence of a perfect set of 5 lambings in 3 years. A ewe’s failure to rebreed at one of the 5 breeding periods would result in a lifetime pattern of two 7-2 month intervals followed by one 9.7 month interval, which is exactly 3 lambings every 2 years. Therefore a ewe does not have to be perfect to achieve a respectable accelerated schedule. For that matter, a shepherd might wish to lamb only 3 times in one year. 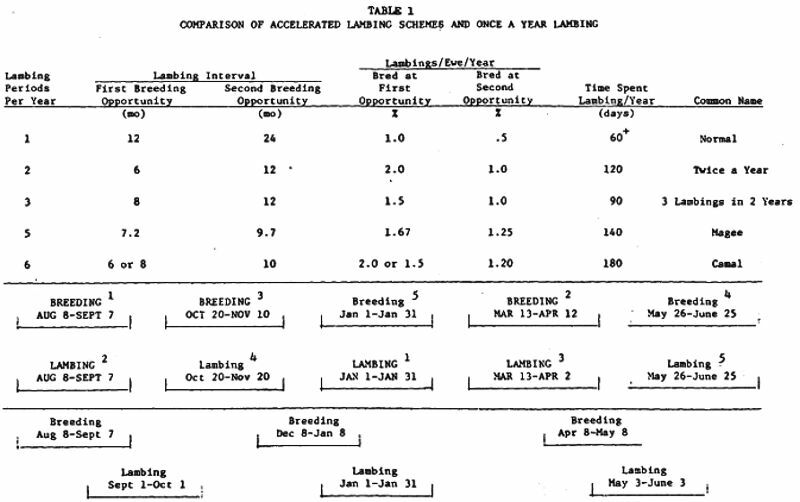 By following the schedule in upper case letters in Table 1, two sets of lambing and breeding periods would still coincide for ease of management. This variation of 3 lambings in 2 years also allows the possibility of an extended lactation during the peak summer pasturing season. As can be seen in Table 1, August 8 has been chosen to start the first breeding period. This fits our teaching and research needs and is also our best guess for optimal performance of our Dorsets. One may choose to start the first breeding and lambing period on any other day of the year and then space the start of each succeeding breeding one-half sheep gestation (73 days) apart to fit the year exactly. Ewes on the CAMAL System were first exposed to the ram during their 56 day lactation period and for the second time one to five weeks postweaning. 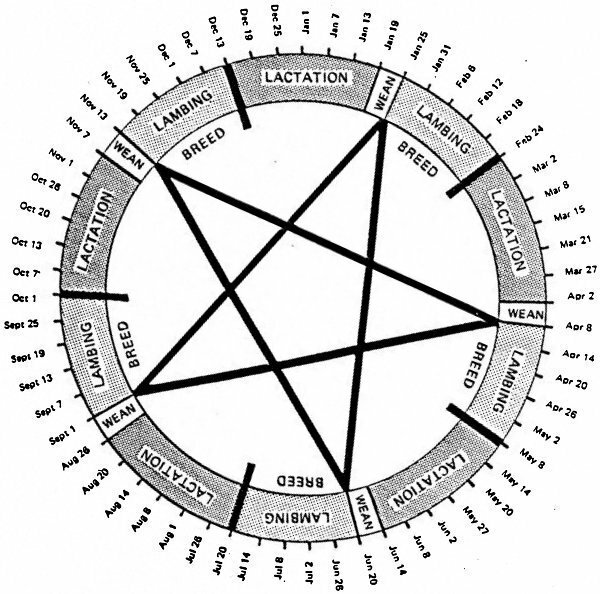 On the MAGEE System all lambs are weaned one week before the first breeding period so that the stress of lactation is usually shorter than on the CAMAL System. During the winter, spring and summer breeding periods a fertile ram is put with the ewes for 30 days. For the October-November breeding, a 20 day breeding period has proven to be long enough. In the August-September breeding period, I have had success synchronizing the breeding of Finnsheep naturally by exposing the ewes to a teaser ram (vasectomized) for the first 10 days of the breeding period and then replacing the teaser with a fertile ram for the last 20 days. The last two years my Finns have bred within a three day period and lambing in January has only lasted for one week. A marker is put on the ram’s brisket during all breeding periods so that the first ewes bred are well-marked on the rump. Two weeks later the color is changed so that rebreeding can be detected. Little or no remarking means the ram is doing his job. If there are many ewes being marked for a second time, one should put a new ram in with the ewes. Having an active fertile ram is an absolute necessity. Because of genetic variation, the widespread use of hormones and light therapy, there is no guarantee that a fall born ram will breed in the spring or summer. I test rams by keeping a monthly record of the scrotal circumference. If the circumference recorded during the fall decreases by one inch or more in either the spring or summer, then I don’t use the ram. The temptation to extend the breeding period for longer than 30 days should be strongly resisted. Remember the ram will be back with the ewes in 45 days. Extending the breeding period may pick up young ewes cycling for their first time yet by waiting for a later cycle, at the next breeding period the young ewe may be more fertile. I also cull spring born ewe lambs not cycling by 10 months of age for meat while they are still lambs. 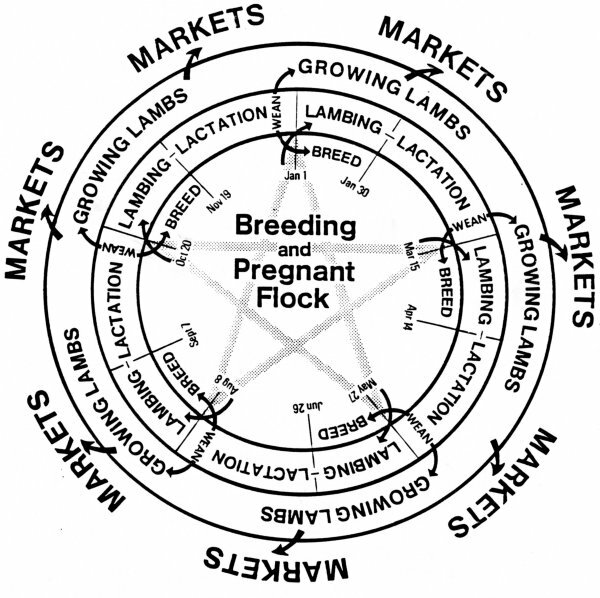 Feeding the flock over an extended lambing is inefficient and long lambing periods do not optimize labor efficiency. Instead of just making it through another lambing (the feeling often expressed by once a year lambing shepherds), a short lambing period can be enjoyable and any problems will be more likely remedied instead of forgotten before the next lambing. Cash flow can be more even on a successful system and money made on one crop can be reinvested for a second return in the same year. Table 2 compares the last year’s performance of September lambing Cornell Dorsets on the CAMAL System with the first year’s performance of August-September lambing Cornell Dorsets on the MAGEE System. It can be seen that lower lambing percentage on the CAMAL System offset slight gains made in shortening the lambing interval to produce an unimpressive 166% annual lamb crop. The next year on the MAGEE System, a shortened interval coupled with an increase in lambing percentage increased yearly lambing rates substantially. The increase in annual lambing percentage of mature Finn sheep on a 7.2 month interval is even more dramatic. The ewe that gestates on summer pasture and lactates on fall pasture can produce several lambs which often sell for a premium at Christmas time. This ewe has generated a greater profit for her owner than could normally be realized from the sale of many spring born lambs. For the skeptic or critic of accelerated lambing who feels it is not possible or unnatural to expect a ewe to lamb continuously in less than a 12-month interval, it might be pointed out that the native Criollo sheep of Ecuador and Columbia lamb naturally every 7 months. They have the advantage of a constant day length which is probably the most difficult obstacle to overcome at our latitude. Yet my experience with this new system makes me optimistic for the possibilities of successful accelerated lambing operations that require no artificial light or hormone therapy. Careful attention to a few important details of feeding, breeding and management will go a long way in releasing the tremendous production potential many of our sheep have in store for us. Lambing (first 30 days) and lactating ewes. Breeding (first 30 days) and gestating ewes. In the last half of gestation. Breed 1/3 of the flock for the first 30 days of the first 73-day period. Add the second 1/3 of the flock to the breeding group for the first 30 days of the 2nd 73-day period. Near the end of the 2nd 73-day period, use udder palpation to sort out ewes for lambing in the first 30 days of the 3rd period. 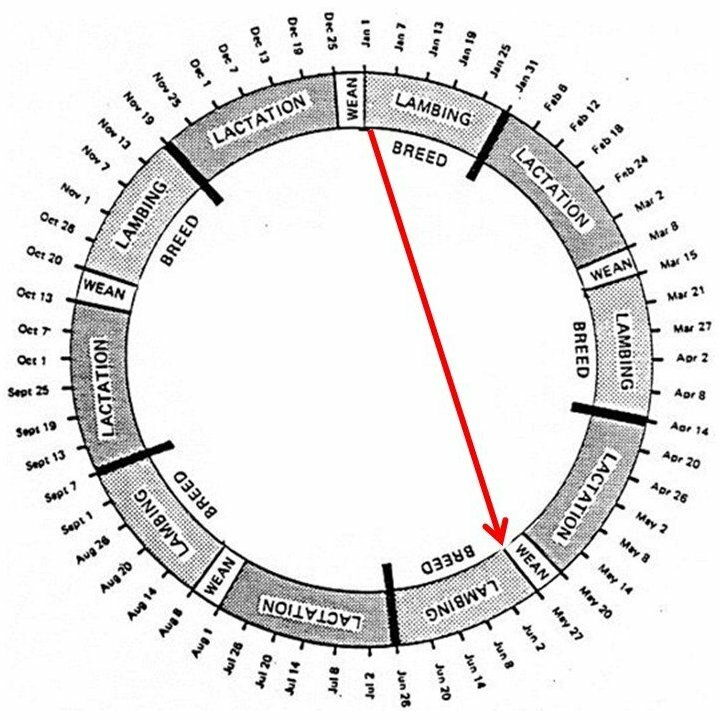 Add the third 1/3 of the flock to the 30-day breeding period of the 3rd period (during which time any ewes bred during the first period should be lambing). Breed non-lambing ewes during the first 30 days of each 73-day period (about half should be pregnant so only about half should need to be bred). Near the end of each 73-day period, use udder palpation to sort out ewes for lambing in the first (20 to) 30 days of the next 73-day period.